A small daibutsu (Buddha) statue which sits at 1.8 meters tall. “Kamagaya-Daibutsu Station” is “Japan’s only” daibutsu-named station. 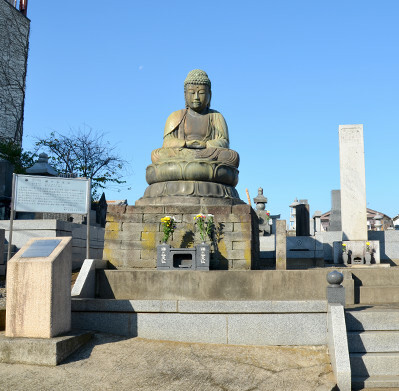 The daibutsu is in the entrance of the cemetery in front of “Kamagaya-Daibutsu Station” after exiting, and as it is very small, it is not uncommon to hear stories of people asking “Where is the Buddha statue?” even if it is right in front of them. Kamagaya-Daibutsu was built by wealthy merchant Fukuda Bunemon who lived in Kamagaya village in the Edo Period (1776). A daibutsu being created by an individual is extremely rare, as there are only 2 examples of this within Japan. As it is very close to the Shin-Keisei Line’s Kamagaya-Daibutsu Station, it can be seen easily from the road. 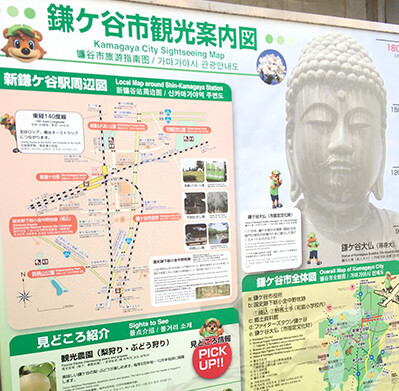 Materials related to Kamagaya-Daibutsu can be found at the “Kamagaya Local Museum” which also distributes English pamphlets, 5 minutes walk from the Shin-Keisei Line’s Hatsutomi Station. (1) From Ueno Station to Matsudo Station on the JR Joban Line (journey time 17 minutes). Transfer to the Shin-Keisei Line at Matsudo Station and get off at Kamagaya-Daibutsu Station. (2) From Narita Airport Station to Shin-Kamagaya Station on the Narita Sky Access Line (journey time 29 minutes). Transfer to the Shin-Keisei Line at Shin-Kamagaya station and get off at Kamagaya-Daibutsu Station. 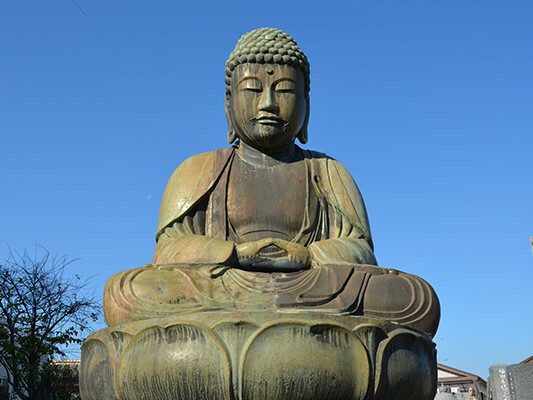 The daibutsu, selected as the most loved cultural property in Kamagaya City by locals. Despite metal contribution during the Second World War and the danger of disappearance due to proposals for purchase post-war, the daibutsu was protected thanks to the help of the Fukuda house’s family head and the local community. This is proof that from the past until the present it continues to be beloved by local people.